Having planned a day cruise up Indian Arm, I decided to consult my local weather, tides and so on. I’m not sure when they gave the Environment Canada website a new look, but it’s fantastic. The information table for the Georgia Basin is the same as we’ve known it for years, but the overall look and feel of the page is more modern. As a graphic designer I particularly like the outer glow around the maple leaf. Nice touch! 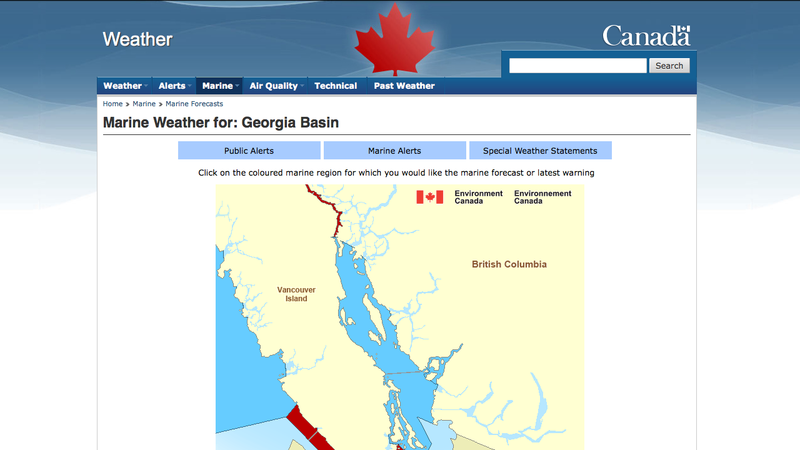 When you land on the page for Vancouver weather there is now a drop down menu for the Marine Weather section that provides a list of areas across Canada. It’s a really nice, little change that should make navigation through an already heavy, information laden website a little bit easier for all of us.